The new Gert Town Natatorium replaced the old dome-topped Gert Town Swimming Pool, which opened in 1980 and was severely damaged by Hurricane Katrina in 2005. The pool sat closed and abandoned for years until 2011, when the city demolished it with FEMA’s approval. FEMA funding allowed for a new 19,000 sq. ft. natatorium which shares a community plaza with the new neighboring Second District Police Station. The two facilities will go hand-in-hand, offering first-responders a chance to conduct water safety and rescue training, as well as draw local youth closer to law enforcement. To meet the varying needs of the community, the 3,600 sq. 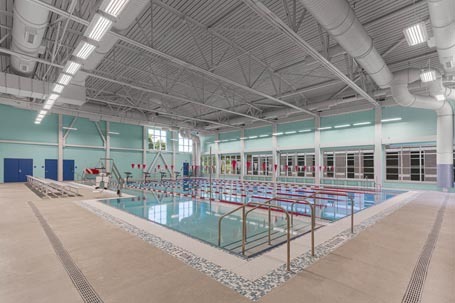 ft. pool has six 25-yard lap lanes, seating for spectators, as well as a zero-depth ramped accessible entry to allow people at various levels of ability to be able to use the pool. The facility will provide swimming lessons for all ages from preschool to seniors, and high- and low-impact water aerobics among other classes. The lobby has a tall glass lantern to serve as a beacon, bringing people from across the neighborhood and across the city to the door. 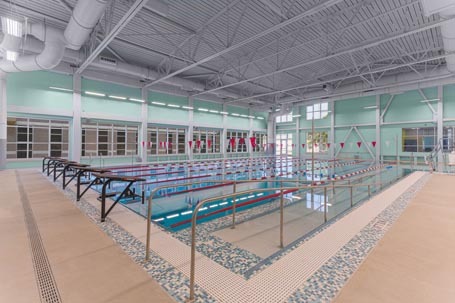 The design team designed the natatorium in two parts. The high-ceilinged natatorium itself was built to stand up to the high temperatures, humidity, and associated corrosion inherent in indoor pools. The adjacent entry lobby was free of these considerations allowing for more standard construction and intricate detailing to welcome the community.